I didn't have high expectations from today. After the dreamlike quality of the last few days, I expected it to be anticlimactic. I tweeted in the morning about wishing I could go back to sleep and wake up at home. But today was anything was a disappointment. It was the perfect end to a perfect trip, and it was really more my kind of day than any of the others. I slept late last night after staying up to pack. I haven't had one full night's sleep since I left home on Saturday so I was tired and jet-lagged. A blister on my toe from walking. Skin chapped and bleeding from the dry cold. I had breakfast with my boss and said goodbye to her before she got in the cab taking her to the airport. Then I resumed my packing and waited for Oliver to come. He finally called a little before ten a.m. I went down to the lobby. He looked exactly like his pictures (big surprise!) and we hugged for the first time. I brought him up to my room because he had a client call. I finished packing and leafed through a couple of magazines till he was done. It was around eleven when we walked to the Museum of Modern Art. I felt it with Kelly and with Ver, and I don't know why I'm surprised: like I've known them forever. I have known them a long time. Oliver was my boss almost six years ago: my first marketing boss. We used to have long chat conversations that continued for a while after he moved on. This was the first time I met him in person. But it didn't feel new, walking with him, discussing the art and architecture around us. The MoMA was everything I'd expected the Met to be. The Met was big and chaotic and haphazard, and I was too tired to appreciate it. 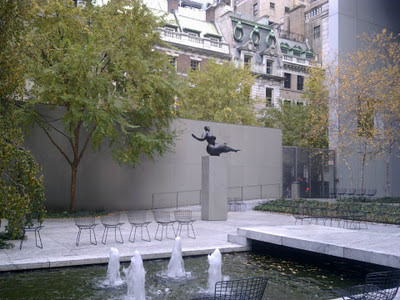 The MoMA contained the breathtaking beauty I'd longed for. We walked through some rooms, discussing what we experienced. Some contemporary sculpture, then some Impressionist art. I confessed my ignorance of art to Ver. He had studied it, I knew, which was why the MoMA had seemed like the right place to go with him. And then I glimpsed a Van Gogh and cried out. We walked over. I don't think I had seen the Olive Trees before, but it was unmistakably a Van Gogh, and very similar to the Starry Night. And then I saw the Starry Night itself and stood mesmerized for a while. Ver came over to admire it. "His paintings have this children's-illustrated-book quality to them, don't they?" I said. He smiled and nodded, more in agreement than disdain, I hope. We walked into another room and I met Monet again. One giant Water Lilies painting took up all of one long wall, and another large one stood just opposite. I thought of how much the Guy would have loved it. "But it's his fault for never visiting while he was in Philadelphia, right?" This time, Ver agreed more convincingly. I told Ver about my favorite annual work project: finding pieces of art for our embroidery team to recreate for our holiday card. I mentioned a couple I had suggested that weren't ultimately chosen, brought to mind when I saw other works by the same artists. "And you said you know nothing of art!" exclaimed Ver. I explained that I'm very interested and have read a bit about it, but I don't have any formal grounding. My knowledge, such as it is, is patchy. Other artists whose works I've long wanted to see and saw here are Frida Kahlo, Diego Rivera, Gauguin, Matisse, Joan Miro... oh, so many. It's funny, as I told Ver. My favorite artist was always Monet. My parents had a Van Gogh Sunflowers print hung up at home, but I wasn't a big fan. One day, I walked into this little store in Koregaon Park in Pune and found little reproductions of famous paintings by a local artist. I felt I could only afford one, and Monet's bridge seemed to be the obvious choice. But my eye kept going back to a rendition of Van Gogh's Irises. The colors, layered thickly on the canvas, called out to me. That's the painting we still have in our home. We had a lovely lunch in the museum cafe after a long arduous wait in line. We went out to the sculpture garden and admired the pretty picture the fall trees made with the sculptures, the fountain, and the skyscrapers in the background. I feel so fulfilled now, so at peace. So wonderful to be able to meet and talk to Ver, and share something so special with him. I feel so lucky to have people like Ver and Kelly in my life, who have not only been great to work with, but have been so kind to me, have made my life so much richer. And also glad to have the Guy to go home to. wow i really liked the assortment in the first sculpture garden picture! 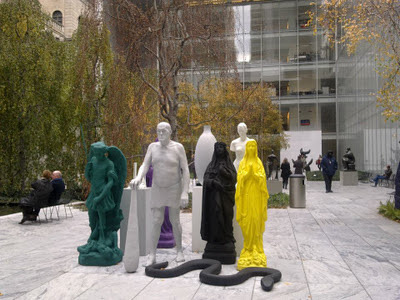 I loved MOMA. Somehow the Met didn't appeal to me much. Your post brought back so many memories. Monet's water lilies and the Van Goghs, of course. I was personally absolutely delighted to see Brancusi's Bird in Space which I had read about as a youngster. Such an awesome place!